Issued by R.J. Lea, Ltd. in 1939. From Britain (Manchester) with mention of Tournament, Chairman, and Chairman Junior Cigarettes on back. Each card measures approximately 1-7/16" X 2-5/8 inches. Set of 54 numbered cards. High quality black & white real photo images with glossy front. Descriptive text on back and I've shown the reverse side of each card in the gallery below. Featuring many of the biggest Hollywood actors and actresses of the day without many surprises. 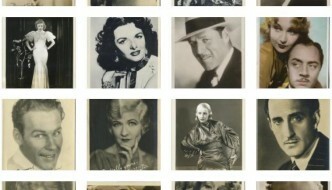 Included in the set are names such as Greta Garbo, Clark Gable, Joan Crawford, Marlene Dietrich, Spencer Tracy and Mickey Rooney. Just click on any image to open to full size and from there you can scroll through each image in the gallery. Text listing of contents follows below.